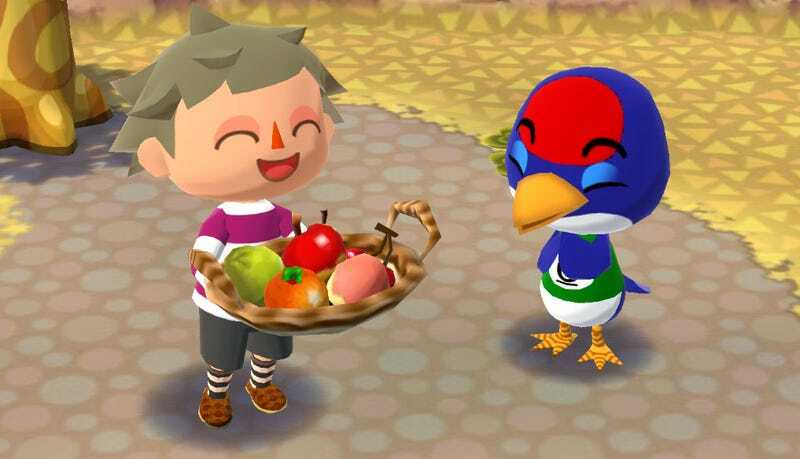 Animal Crossing: Pocket Camp isn’t supposed to be out until November, but for some reason Android owners [Update: and iOS users too] in Australia can download and play the game right now. And hey, I’m an Android owner in Australia, so let me show you how this thing actually works. Players are greeted by KK Slider before being dropped off for a tutorial with Isabelle. Like Super Mario Run, Pocket Camp takes an established Nintendo series and tries to make it work on a mobile device, modifying its fundamentals to fit mobile’s free-to-play sensibilities. Unlike Super Mario Run, though, Pocket Camp feels like a much fuller experience, one less compromised by the, well, compromises needed to make the move to iOS and Android. For anyone who has been hanging out for the series to make the jump to a more modern system, it looks gorgeous on my Pixel XL’s screen, with nice clean edges and bright, vibrant colours. You might not have been expecting this to be the best-looking Animal Crossing game ever made, but hey, that’s what we’ve got. You’re given quite a lot of customisation options before getting started (and you can revisit this at any time in a menu to make adjustments). Like most Animal Crossing games, you once again take on the role of a human kid dumped at the doorstep of an animal community, only instead of a town, you’ve now been put in charge of a type of summer camp. The basic premise of the game remains the same—run around doing mundane tasks like collecting fruit in exchange for rewards, making friends along the way—only the camp setting gives everything a slight twist. The game is centred around your campground, which you can kind of view as a replacement for your house in regular Animal Crossing games. It’s a central space where you can get new furniture and arrange it, but instead of simply doing so for your own pleasure, you’re looking to create a space for your animal friends to hang out. The map screen is where to jump from location to location. While the game loads (and downloads data, around 50-80mb at a time), you can play a quick little minigame to collect coins. Pocket Camp’s essential services are spread across multiple areas that you need to drive between. Fishing is done at the beach, for example, while you need to head to the woods if you want to pick fruit. Fishing is much the same as you’re used to (if a bit easier, since you now need to tap), but note the cooldown timer on the fruit trees, there to stop you going nuts and farming your way to a quick luxury campground. This kind of work is familiar to anyone who has played Animal Crossing before, but what’s new here is that you’re not just collecting items to sell, you’re gathering them to craft, because that’s what Pocket Camp’s economy (both in-game and in the real world) is based on. To get new furniture and props for your camp, you need crafting materials, which are gained both naturally (by fishing, picking, etc) and by trading rewards (giving a fish to an animal who wants one, for example, might result in them giving you some cotton). The central camping ground area. Get enough and you can have new stuff built. Which takes time, and here we see the lure of real money transactions creeping in. If you want to get a new bed made, it might take a while in realtime, or you could just spend some Leaf Tickets and have production sped up. These tickets can be earned through play, and you don’t need them since they’re not doing anything that impacts gameplay, but they’re also available for real money, so the temptation is obviously there. Once you’ve crafted a piece of furniture, you’re able to place it in your camping ground. Leaf Tickets can also be spent on things like inviting KK Slider to your camp. There are banner ads promoting these offers. Where this would feel like a gross intrusion in most series, when it comes to Animal Crossing—whose entire reason for being is to revel in the most fucked up elements of capitalism—what does it matter! Where the grind is something most people pay to avoid in phone games, in Animal Crossing it’s often been the point, and something players have had to do regardless of the platform. Now they’re free to keep on grinding if they want, or pay a few bucks here and there if they ever feel impatient. This is Jay. Jay and me are now friends. As you can see from the detailed friendship status. Because the game’s only out in Australia, and it was only released a few hours ago, I couldn’t really try out the social and muliplayer stuff, which is a bit of a shame; being able to directly show off your camp to friends seems like a massive part of Pocket World’s experience. But what’s there at the moment feels, for all the changes to the game’s presentation, like a fundamentally Animal Crossing experience. You run around a map doing jobs for animals, you talk to them, they’ll say funny stuff in that iconic chirpy voice and at the end of the day you’ll have scraped together enough compensation to maybe build yourself a bedside table. Only now you can do it on your phone and it’s free. Obviously these are just some early impressions based on the game being available in a single region, not a review, and we’ll have to see how multiplayer works and what effect on the community any tinkering with the game’s economy has later down the line. But as someone who yesterday was fully prepared for an Animal Crossing phone game to be a glorified Miitomo, I’ve been surprised by how much of an Animal Crossing game Pocket Camp has turned out to be.